Would I buy from them again: as of April 2011, definitely yes. I'm looking forward to new eyeshadow collections, and hoping to see a general expansion of the line. I first started buying from Shiro some time in the summer of 2010. I got several colors from Shiro's first big collection, and was impressed with price, turnaround time, color payoff, and longevity. I've continued to watch the store, and I think at this point I have every one of Shiro's eyeshadow colors at least in sample size. It's another Etsy store, like just about every other Etsy store; so the layout and organization are fairly standard. The text is easy to read, the navigation is fairly straightforward, and the methods for selection and payment are the same as for any other Etsy store (which is actually quite a lot like most ecommerce sites.) The photos she posts are quite nice. 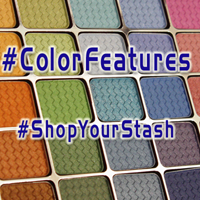 I do wish that there were swatch photos for all of the colors, but since the pictures in the pots are very clear and the descriptions are often fairly straightforward - "opaque bright purple with shimmery blue undertones" - it's not too difficult for a newer shopper to get an idea of what the color will look like. I do wish that it was possible to have categorical listings of the collections and all of the individual colors in each one. That may have been in the Etsy shop at some point, but as of March 2011 those entries are no longer there. This makes it a bit difficult for a customer who's new to Shiro to see what colors are in each collection. My first orders placed with Shiro were turned around very quickly - within the next day or two, I received shipping notices. Since Shiro's base of operations is just 300 miles away from me, the actual shipping itself never takes very long. Orders all come in a red organza bag, with the ordered items, a business card, and a free sample or two. When I was first ordering, the samples were in baggies with stickers that included color name, ingredients list, and company name. (Impressive, for a sample label to include ingredients. I am favorably impressed! It helps folks who primarily or only order samples - not only do they know the color and company, they even have a list of ingredients right on the sample baggie.) Again, when I was first ordering, the fullsize jars all had custom stickers on top of the lid (different for each collection), and stickers on the bottom with color name, company name, quantity, and ingredients. The individual jars had a sifter, and were outer sealed with a shrinkwrap band. Now, the jars have no outer seal, but they do have the sifter and sifter-seal. I've never had problems with in-transit spillage - something I appreciate very much. The shadows have excellent color payoff. Most are very richly colored, and all are medium to extremely pigmented. Only a few - Master Sword, described as "super glittery", and Puzzle Cube, likewise - have given me any sparkly fallout. The others have shimmer or sparkle -=minus=- the fallout-factor commonly associated with shadows like Urban Decay's Midnight Cowboy (or the sparklier Aromaleigh Rocks! colors). Application is smooth, and the shadows blend well. They also last all day without fading or losing/changing color. Many of her products are vegan - the individual listings for the colors state whether a color is vegan or not. 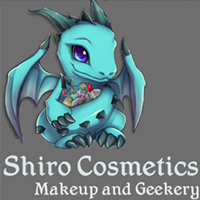 Shiro has good products, at a very good price. I wish the site itself did a better job of showcasing the shades and products, which would let her leave the Etsy site for shopping and let her tailor the site itself for serious browsing and showcasing everything she's got available. The product line is still smallish, though it does include colors for eyes, lips, and face. The store's been semi-fallow lately, with a lull between collections and then the move to the warehouse space; but hopefully a new release will come out soon. (I think the company's one-year anniversary is coming up soon - maybe there will be a new collection of something?) Shiro is definitely a good company to watch, and a good company to buy from.